Brian found the floor tiles that were left from this job and installed them. He had to make a Lowes run for some wall adhesive for the tiles around the bottom. When the toilet paper holder was, our patch job is mainly hidden by the vanity. I put in two tan ones I had saved for the 6 missing above (where you can’t see). I’m waiting on the mosaic samples now. 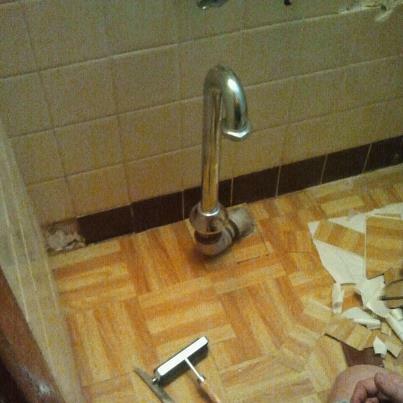 Brian cut the hole for that lovely drain pipe in the vanity last night. He ran into a snag getting the marble top screwed on, so called it a day a little after 9:30. He’ll get that and the sink in place and work on the plumbing. It will look pretty. It’s tight in there, but can’t help that.